A while back when I did my Copper Chalkboard Platter Door Chimes project I said I would have a metal stamping tutorial in the future. Well here it finally is. 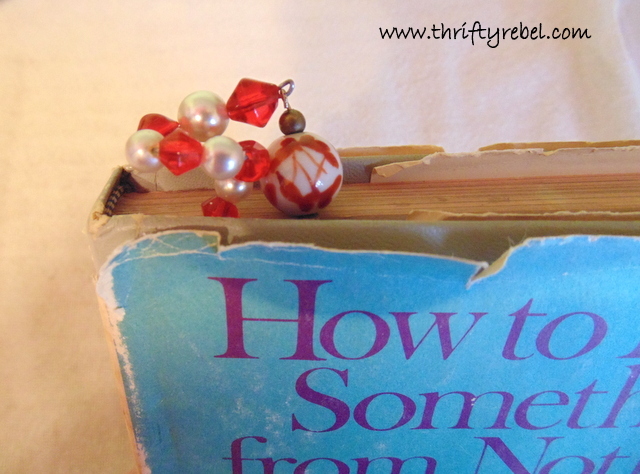 I wanted to do a simpler project so I chose a bookmark that can easily be used as a Christmas tree ornament as well. 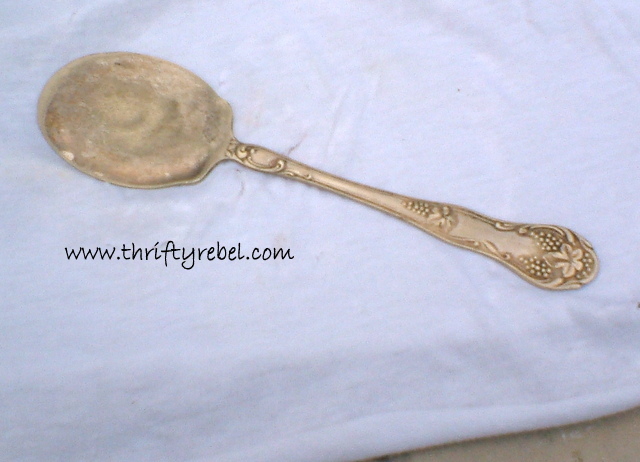 I used one of the silver plate spoons from the lot that I won in a flea market silent auction recently. I showed that in this thrifted finds post here. 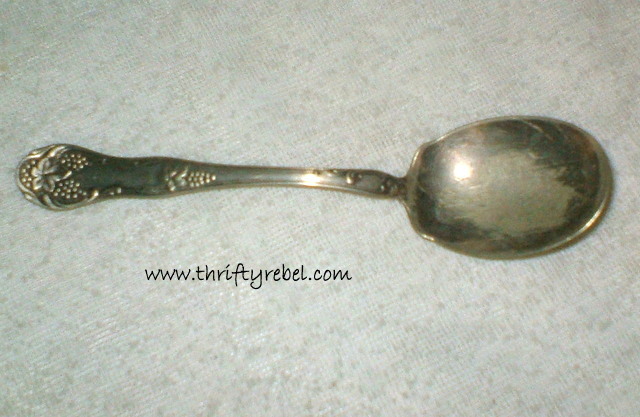 Silver or silver plate spoons are best because the metal is soft. I’ve tried to hand stamp stainless steel and it’s very difficult… if not impossible. 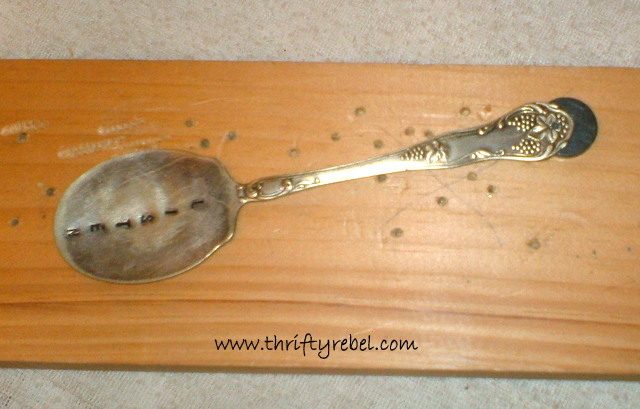 Sometimes I polish the spoons before I start a project, but I decided to leave this one as is… tarnish and all. I don’t have an anvil (but I’m on the hunt for one) so to flatten and stamp my spoons, or whatever cutlery I’m working on, right now I use a large and massively heavy slab of marble that we use as the bottom step off of our back deck. It was left behind by the previous home owners. 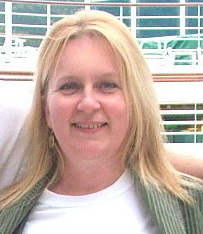 I use an old t shirt underneath… one without any texture in the material. 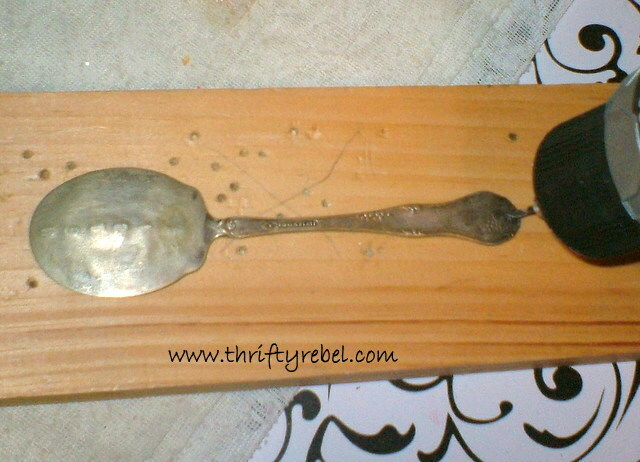 Texture can be transferred onto the spoon when you’re flattening it. I always start with the spoon face down. I’m not sure it matters, but that’s how I do it. I put the t shirt on top as well. And then I just use my regular household hammer to flatten the spoon… turning the spoon over and over until I’m happy with the end result. There’s no real technique here… just go for it. 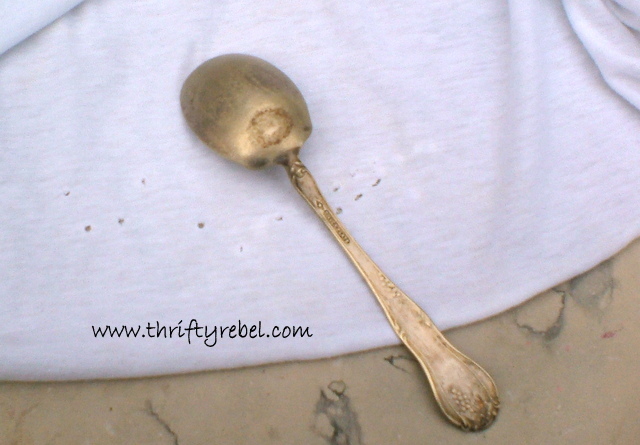 Then I hammer down the handle of the spoon to flatten that out as well. For this project I’m using the Tekton metal stamping kit that I bought off of Amazon. It’s working really great for me. It’s what I use when I’m stamping entire words on my projects. The letters are 5/32″ high, and it includes capital letters A to Z, numbers 0 to 9, and the & sign. If you do a search on Amazon, or on Google for that matter, you’ll find all kinds of kits out there. 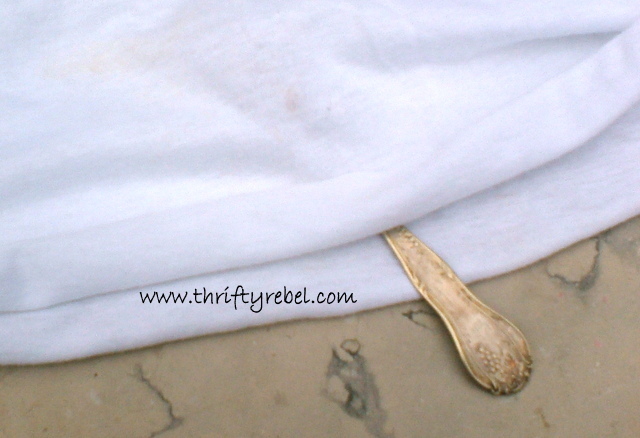 I place my spoon on the fabric… this helps to keep it from moving. I decide what word I’m stamping and figure out how far apart I want the letters to be. I do this just by eyeballing it. Then I line up my stamp, double checking to make sure that it’s facing the right way. Believe me it’s so easy to stamp a letter upside down. For this project I’m doing my word vertically. I’m still practicing doing words horizontally on wood because I find that much harder. Once I’m confident I’m good enough at lining up the letters I’ll try a spoon project. I make sure I have a firm grasp of the stamp, and then I hit it 3 to 4 times with my regular household hammer. It’s almost impossible to put the stamp back in place if you don’t hit it enough times to make a good impression. I’ve tried and it doesn’t look good. It does take some practice to get to know how hard you need to hit, and how many times. 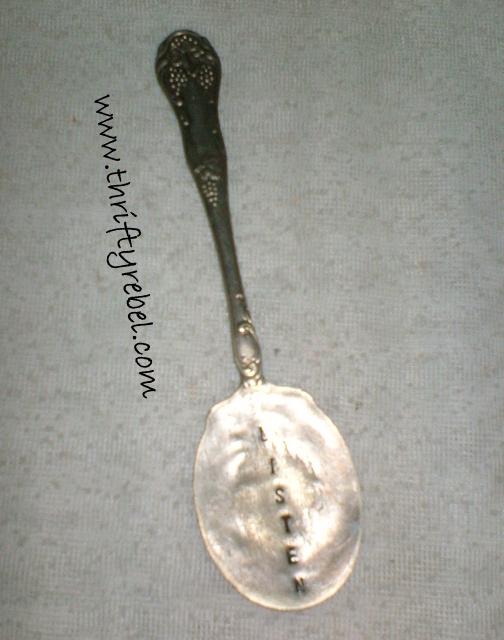 I practiced on some silver spoons that were in bad shape before trying an actual project. 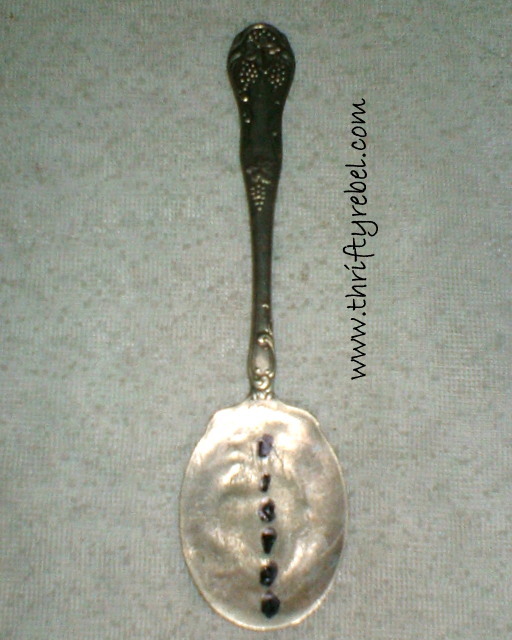 Here’s my spoon… all stamped, and at this point you can hardly see the word. This is where a permanent Sharpie comes in, and I mark over the letters… leaving it for a few seconds. This is what it looks like after you rub the spoon with a slightly damp paper towel to remove the excess marker. You may have to do this a couple of times to get the depth you like. I chose the word listen because to me it’s one of the most important things that every one of us should do. In our every day lives of course, but also when we’re reading. John and I are big readers and books are precious to us. And it’s not just about seeing and reading the words… it’s about listening and hearing them. To me there’s no difference between reading a great book and listening to great music. Now when I open a book and see the word listen on the spoon it immediately reminds me to slow myself down, put the busyness of the day behind me, and just enjoy whatever book I’m reading. 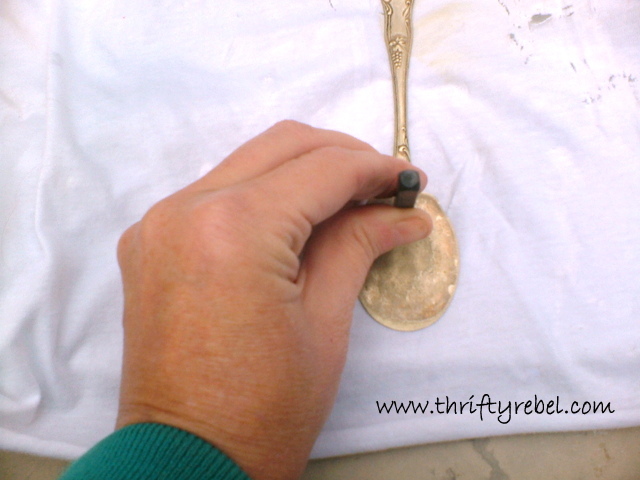 Silver and silver plate spoons are very easy to drill into if you are using a metal bit. I use a 3/32″or 1/16″ drill bit specifically made for metal. The trick is as you’re drilling you put just enough pressure on the drill with your weight to help guide it without breaking the bit. There’s no way to know how much pressure is just enough without just trying it yourself. When I was first learning I broke a few bits before I got the hang of it, but they’re pretty cheap so it didn’t worry me. Always always always wear safety goggles when drilling, especially when drilling into metal. I looped a long ornament hanger into the hole and added some beads to it. Because it’s Christmas I used red and white, sort of going for the candy cane look. I made a simple loop at the end with pliers and added a bead from an old broken earring. 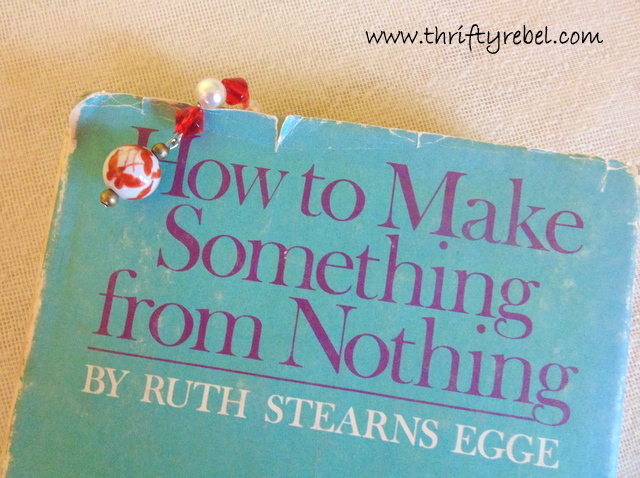 Last week I showed you this fabulous vintage junkin’ book that I found recently. Well here’s the bookmark in use while I’m reading it. 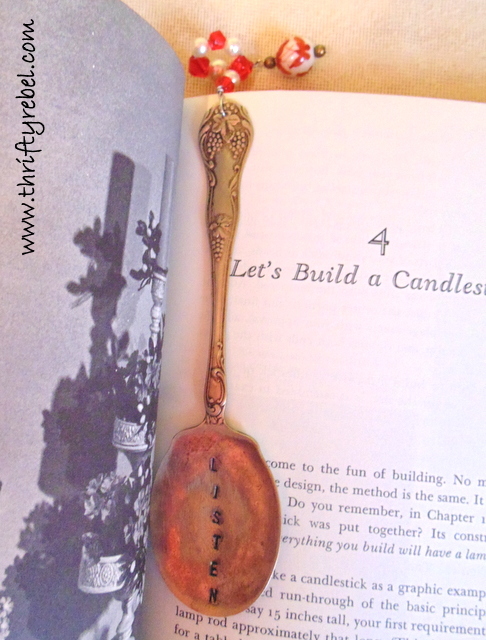 Because this book is rather thin, I slid the spoon in to mark my page and bent the wire over the front cover. If I’m reading a thicker book, I’ll simply twist the wire so it sticks out the top of the book like this. 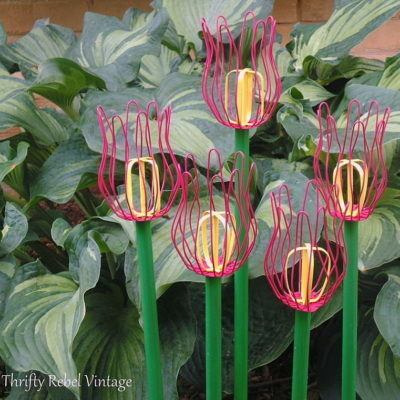 Or I’ll bend the wire like a candy cane and hang it on my tree like this. When I was half way through this project I was debating whether or not to polish the spoon, but now I’m glad that I didn’t. I can still do that if I change my mind. And, knowing myself, that could happen at any time. lol. What would you do? Would you leave it naturally aged like I did? Or would you want it shiny and new? Thanks so much for reading… and listening. Recent Posts in case you missed them. How pretty Tuula! I have some metal stamps, but have done nothing with them but frustrate myself! I can never get them lined up even close! Yours are fabulous and what a great idea to make a book mark out of them! That is fabulous! 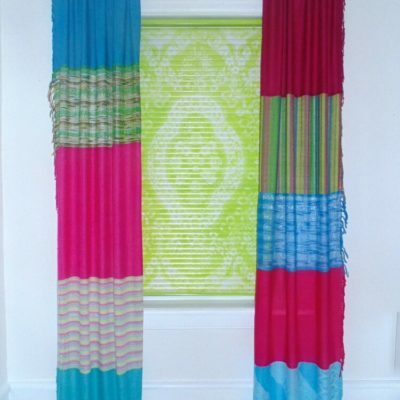 I love love love this idea!! I love this . 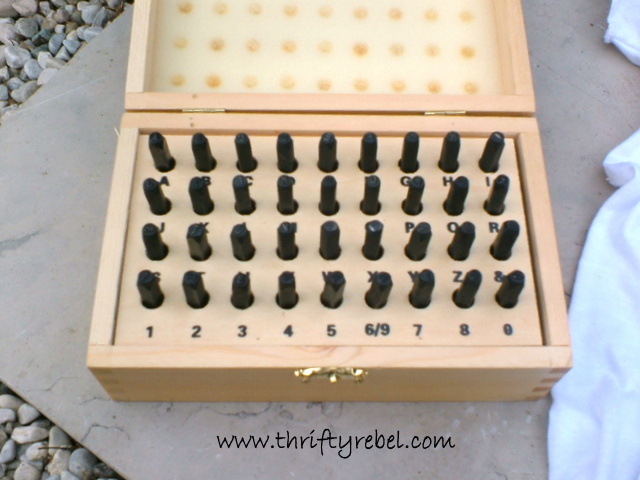 Now I am on the hunt for a stamping kit. Thanks for sharing this. I always wanted to do the stamping . These are too cute, love them!! Tuula, this is amazing! And I love the idea of using it for a bookmark 🙂 You are such a talented and creative lady. Have a beautiful Tuesday! I have the supplies, but haven't done it yet either! I love this idea for a bookmark or ornie. I love that spoon exactly how it is!!! I think it adds to its charm. Very pretty. Nice ornament ! Have a Merry Christmas. 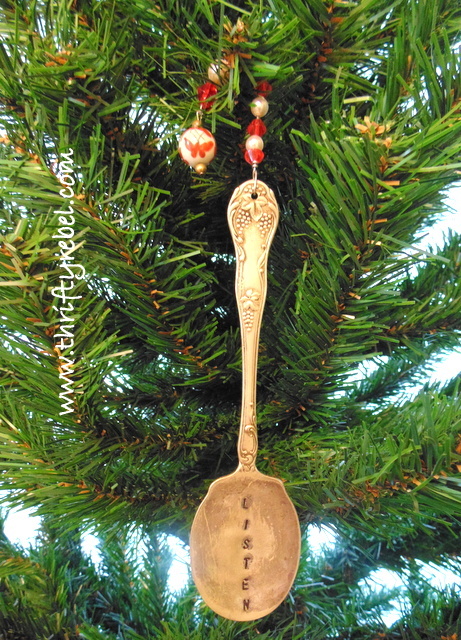 Love your flattened spoons used as ornaments or a book mark. Tarnish is good! Thank you, Tuula, I think you anticipated all of my questions in this excellent tutorial. I am bookmarking it and pinning it so I will not lose it. 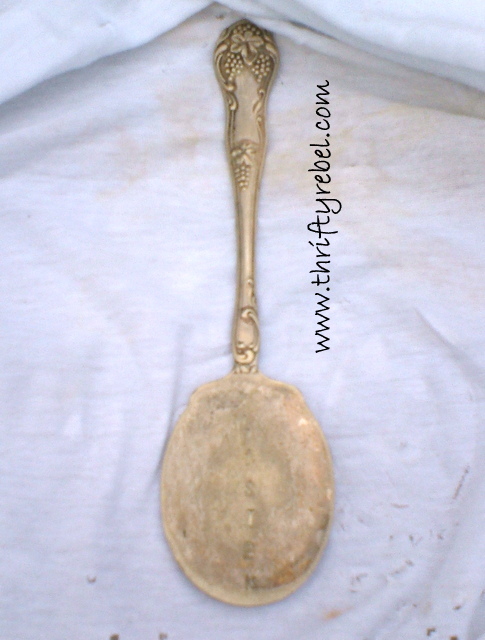 I picked up some silver spoons this weekend to practice on. I will order my stamping kit now that I know what to look for. Beautiful! Why were you disappointed – did it not flatten properly because you did it on concrete? I used to collect book marks when I was a kid. I love this…so special! Thanks for linking with us at Twirl and Take a Bow! Hope to see you again next week. amazing!!! I like the method to make the waste to be other cute things!!! It never occurred to me that you could do this at home so you have opened my eyes to a new technique. I guess I thought a machine was involved in the process. Great tutorial. Wow Terry! That never occurred to me. 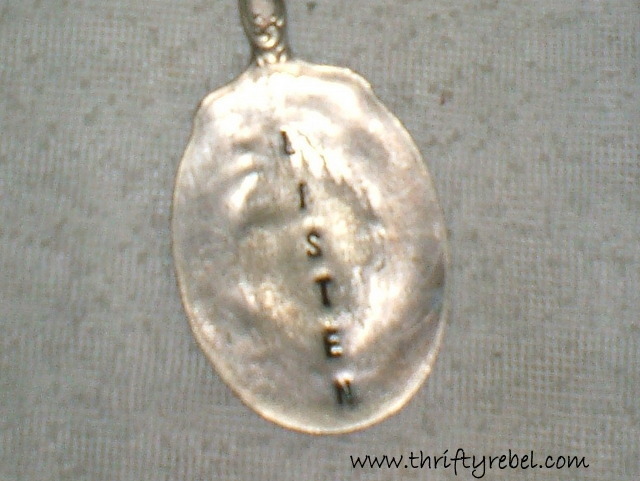 It makes me love the word listen even more. That’s so appropriate. I came over from your wind chime silverware plate site. Lovely project. Thanks so much for a really detailed tutorial. I seen several of these but haven’t wanted to chance ruining my silverware. Yours makes me feel confident I can try it at last. You’re so welcome Gaelle. I’m so happy that my tutorial is helpful to you. 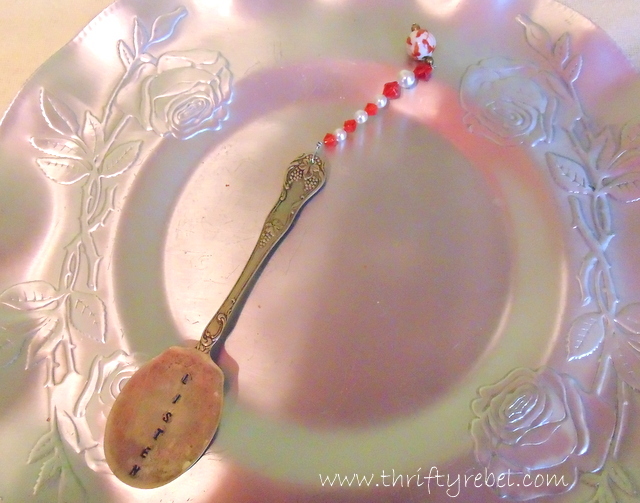 I love stamping silverware and it’s not really that difficult once you get the hang of it. When I was first practicing I used beaten up pieces so I wasn’t too upset if they didn’t turn out very well. Don’t be discouraged if you break a few drill bits at first. That happened to me, but I did learn how much pressure to use and I don’t break too many anymore. This is my all time favorite post! So detailed, so much thought, so much enjoyment from this. I can feel the care in your words. What a great hobby or passion to have for crafting and reading!! The thought of getting and giving an item like this has me over the hills excited. I want to give this a try now!!! Thank you for such a wonderful and enjoyable post! Thanks Liz! I’m so happy that my project has inspired you.